When treating patients with de Quervain’s Tenosynovitis, they may complain of a swollen thumb and radial-sided wrist pain. The pain may become worse, and may radiate up the thumb or forearm, during activities that require abduction or flexion of the thumb. In most cases, de Quervain’s is caused by overuse or repetitive stress, although the condition may develop for unknown reasons. De Quervain’s Tenosynovitis - What’s new about an old condition? 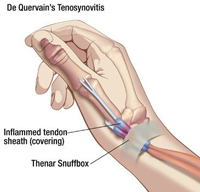 Recently, you may have been hearing about a new test for de Quervain’s Tenosynovitis. This test applies stress to the abductor pollicis longus (APL) and extensor pollicis brevis (EPB) tendons without stressing the thumb and wrist joints. Along with this potential new testing standard for de Quervain’s, the terminology used to describe the condition is also being reconsidered. In the past, tendinitis and tenosynovitis were the general terms used to describe painful tendon conditions thought to be due to inflammation. However, attention is now being given to a more precise descriptive term for degradation of the tendon as opposed to inflammation of the tendon or surrounding soft tissue. Recent literature points to the terms tendinopathy and tendinosis to differentiate tendon injuries.